Twist of Lyme: My Diagnosis at Last! Anyone who has followed this blog for a while probably saw me allude to my failing health. What I’ve represented here in the occasional post is not even the smallest fraction of my daily experiences. I wanted this site to be about creative discovery, not my own maladies. Another reason I was not so forthcoming: I ran the gamut of dozens upon dozens of debilitating symptoms, but an actual diagnosis beyond my myriad nutritional/hormonal deficiencies, strange blood anomalies, and seemingly discrepant individual conditions eluded every practitioner. After 8 years of crippling pain, 70 different specialists, countless hospitalizations, hundreds of tests, medications and supplements, wacky alternative remedies, a host of complications in every system of my body, losing my ability to walk more than a few steps, type, speak/chew (due to jaw pain) and just about any other function required for daily life…one doctor solved the mystery two days ago. I have late stage chronic Lyme disease. I belong to the largely invalidated subset of patients that has had Lyme for so long (possibly 27 years!) that it no longer shows up in bloodwork; it hides in organs, tissues, and coagulated deposits. My doctor was savvy enough to examine a sample under a microscope himself, after many negative standard labs, and sure enough…he saw classic Lyme spirochetes (which I got to see squirming around on video of my own cells. Not the ideal home movie, yet somehow vindicating). They are kind of disgusting, but under extreme magnification look like they’d be delicious with butter. I’m hovering somewhere between shock, regret, anger at the treatment I received during my past decades of suffering, and full-on Parasite Assassin/Lyme Advocate mode. As days go by, I expect to embrace the latter as I embark on a lifelong course of supportive care designed to keep the parasites at bay. These buggers damn near killed me…but they did not. 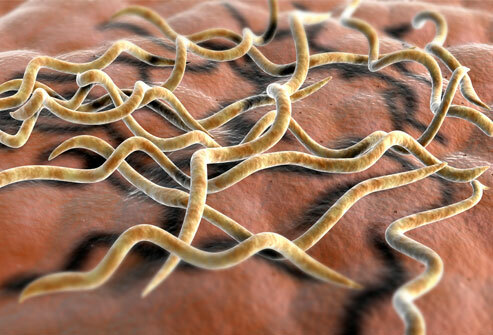 Spirochetes, your days in this host body are numbered. This entry was posted on April 24, 2015 at 4:47 pm and is filed under announcement, medicine with tags announcement, medicine. You can follow any responses to this entry through the RSS 2.0 feed. You can leave a response, or trackback from your own site. I’m glad you finally got your diagnosis! Just wondering what’s wrong year after year is intolerable I know. I was afraid you had what I had (Hep C) and which luckily is now cured, I slayed my “Dragon”! I follow you religiously and share you liberally… I love “She Walks Softly”! Wishing you strength and perseverance… You can kick those nasties in the nuts! ;-). Watch the movie “Lyme Life” starring Timothy Hutton, it’s good. Thank you, Roxanne! That movie is on my list to see ASAP. Wishing you good health as well. Thank God! Now you can finally get better! I can’t tell you how many times I have prayed for you. I will continue to pray for you until you are 100%! Love and miss you. That is shocking, and amazing that this didn’t come to light during the myriad testing you must have endured. But does this mean that you will get to feel better, or is most/all of the damage irreversible? I so hope you will find some relief with this diagnosis and subsequent treatment! I, too, was diagnosed with Lyme, years ago, after a cold I couldn’t seem to shake, combined with a biopsy for what turned out to be an unrelated skin condition, uncovered an indication of Lyme. The infectious disease specialist I saw marveled that I wasn’t seriously debilitated – neurologically, orthopedically – by it going untreated for maybe 18 months or so, during which I just felt as if I was always – barely – fighting something off. (I’m one of those people that doesn’t go to the doctor unless/until I’m desperate.) My strong immune system kept it from becoming full blown, I guess. After a 2 or 3 month course of antibiotics, I was fine, and count myself lucky. I hope you will have enough recovery to let you get on with your seriously detoured life! I’m SO happy you escaped this fate! A history of unrelated poor health predisposed my weak immune system to getting DESTROYED by it. We are going to reverse as much as we possibly can, though it may be a lifelong effort (at least there will BE a life). Sorry to hear that it is Lyme. I am glad that you have found the cause of your troubles and can hopefully start an effective treatment program. Best of luck! Amazing news! Well, kind of horrifying and awful but, holy crap! The relief you must be feeling just knowing what it is and what you can do to mitigate the symptoms. Huzzah! Sooo happy for you! Best news ever! I admire your perseverance . My son is fighting something that eludes a diagnosis and it’s a hard road. I hope you find a pathway to better health soon now that you know what you’re fighting. Cyn, I’ve been through hundreds of symptoms and nearly every dead end a human being can embark on. If I can help your son with the wisdom of my experience in any way, don’t hesitate to email me! Great to hear you got a diagnosis at last! I can hardly believe that it’s actual things you can see squirming around. Hoping you can slay them by the thousands now! It’s disgusting. It’s amazing. It’s something that belongs on your blog. Haha. So glad you finally have the answers and the ability to now battle your ailments. My mom and best friend have both battled Lyme disease in the past and I know how crippling it can be. Thank goodness you found a.doctor who truly cares and soon may much of your pain be a thing of the past. This is great news! Thank you! I hope they both recovered! Finally!! I am so happy you finally have an answer. Such an insidious disease and so few doctors have a clue. I know you will fight the fight as only you can, Dana! You’re going to get well!!! My prayers are always going up for you and I will continue to pray for you. Slay the dragons, dear niece!! Love you always! Who knew my dragons to slay would be so tiny? But what they lack in size, they make up for in number. 😉 Thank you, Suzanne. Love you! I’m shocked but I’m also glad, because now you know who your enemy is. Wish you good luck and power and start your engines to fight this creatures! Thank you for the kind wishes from halfway across the world, Tamara! I’m happy that you can now give a name to your demon and work to stop it. I wish you the best! Now that You have armor and a sword to fight with, this should be a good fight! Best of everything to you Dana! Wow, these evil beasties should be taken out a.s.a.p.! So good that you finally know how to fight this as much as possible. I hope that you soon can do all the things you are longing to do for ages, Dana! What a stunning outcome. You’re posts having given so much creative inspiration and i am so happy that you finally have an answer! I hope you are on a path to wellness! You will conquer this also, Dana.